Educating and encouraging consumers to make the switch to energy-efficient lighting is at the heart of what MaxLite does and we are proud to further that mission while servicing the community through our partnership with Habitat for Humanity. In 2015, MaxLite made a four-year, $1 million commitment to provide energy-efficient lighting products to Habitat for Humanity to be used in sustainable and affordable housing built in partnership with low-income families. Since 2013, our LED and CFL lamps and luminaires have brightened the lives of thousands through programs like the Home Builders Blitz and Habitat ReStore resale outlets. Our team members have also volunteered to help build Habitat for Humanity homes for Partner Families. Led by experienced Habitat for Humanity crew leaders and a site superintendent, employees at our NJ headquarters worked together to install drywall and complete other projects to help prepare a single-family unit on South Orange Avenue in Newark, NJ to become home for a new Habitat for Humanity Newark Partner Family. Our California team members will participate in a similar Team Build Day in Orange County in 2016. 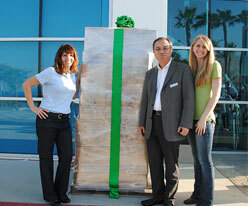 • To celebrate the 2014 opening of its new facility in Anaheim, MaxLite donated $14,000 in products to the Orange County ReStore. Habitat ReStores are nonprofit home improvement stores and donation centers that sell goods to the general public at a fraction of the retail price to help local Habitat affiliates fund the construction of homes within their communities. • In 2013, MaxLite partnered with New Jersey’s Clean Energy Program (NJCEP) to provide discounted ENERGY STAR-qualified CFL lamps and fixtures to Habitat ReStore resale outlet customers in New Jersey. To learn more about Habitat for Humanity, go to Habitat.org.